This pattern has been updated as of 12/1/17. Please print or download a new copy if needed! 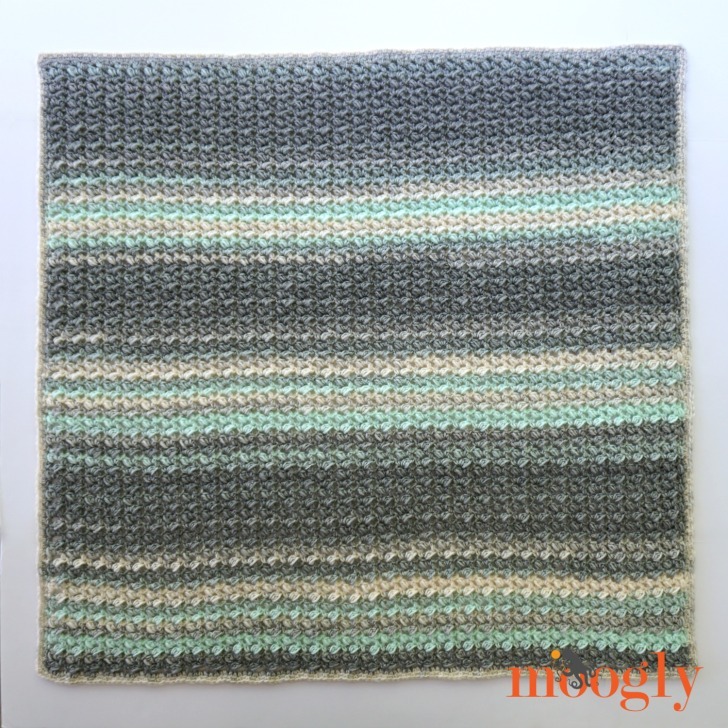 When I started designing the Dream Puffs Blanket, I thought it would be a baby blanket – but this stitch is so darn squishy I decided it’s for everybody! So here is the Dream Puffs Blanket free crochet pattern in 5 sizes – you’re going to love cuddling up in this one! 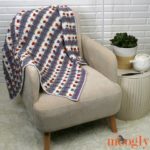 The Dream Puffs Blanket uses this fantastic v-stitch puff stitch combo move that makes for an easy pattern to memorize that creates tons of texture, loft, and warmth. The lovely color changes are created by using two colorways of Lion Brand Scarfie – a self-striping yarn worked in stripes! I used two colorways with a lot in common, but I can’t wait to see what combos you all come up with! Get it as a Lion Brand Kit, complete with yarn – Click Here! Puff Stitch (hdc2tog cluster): yo and insert hook in indicated stitch, yo and pull up a loop, yo and insert hook in same stitch, yo and pull up a loop, yo and pull through all 5 loops on hook. Row 73: Ch 1, hdc in 1st st, *2 sc in next ch-sp, hdc in next 2 sts; rep from * across, sc in ch-4 sp, turn. Edging Round 1: Ch 1, sc evenly around blanket, working a ch 1 at each corner; join. Edging Round 2: Ch 1, *sc in next st, blo sc in next st; rep from * around, working (sc, ch 1, sc) in each corner ch-1 sp; join and break yarn. 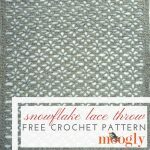 I really hope you give this pattern a try – and let me know what you think! 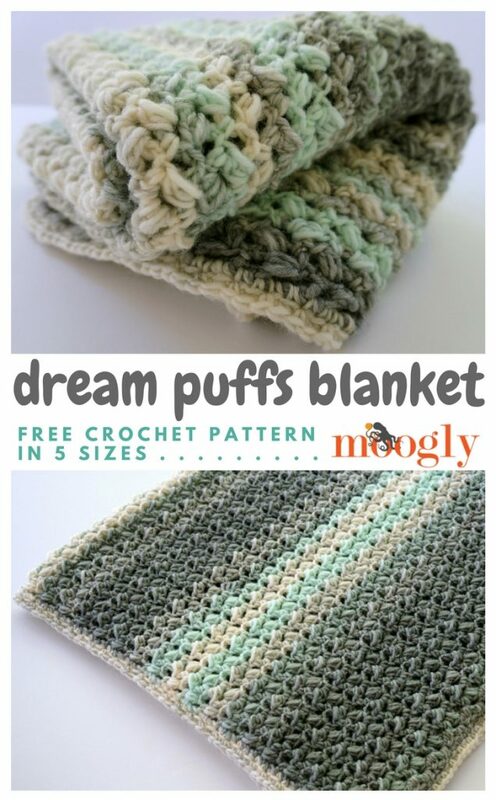 The free crochet Dream Puffs Blanket is a great jumping off point for all sorts of color schemes, and I can’t wait to see your version! If you do share it on socail media, be sure to tag @mooglyblog and @lionbrandyarn! 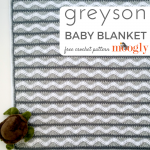 And since this is a free pattern – you are my testers! Please let me know if you find any errors in this pattern using the Contact Me button at the top of the page! Lovely pattern! Looks very cosy! Print friendly not working right. Does not give options. Goes right to print settings. I copied and saved but much prefer pdf. Hope it gets fixed for next person. Thanks. Beautiful pattern. Ah shoot, sometimes it does glitch – opening PrintFriendly.com in another tab usually works even when the button is being persnickety. Hi, I too like to keep my favorite patterns as pdf. This was funny I was going save this pattern and then I realized I have a whole sub folderTitled Moogly AND I made almost all of them some more then once. I thought you’d like that. AND thank you so much. 🙂 You are so very welcome! And thank you so much, no better recommendation! Tamara, how do you connect the yarn changes? Love the pattern, Thank you for sharing. I’m excited to make the blanket. It would also make a great bath mat. I tried the printer friendly and the adds on the side cover half of the pattern so you can’t read half of the pattern or see the pictures. If Print Friendly doesn’t work with your system, you have a variety of other options including the Clean Print plug in and a simple copy and paste to a word processor document. None of the options are blocked on this site. Just got the first box of 6 skeins to ma,e the King size blanket! I dont know which will be finished first… this blanket or my doctorate! Ha! I’ve heard stories about those from friends – best of luck!! Hi there…I’m having a little trouble…is the *(sc, ch 3, puff st) all worked into the same stitch? i have such a tough time pulling up the last yo on the puff stitch it is tight.. i have to redo about 50% of my puff stitches. and it is hard to pull through all 5 loops. Anybody else have this problem? Hi Meredith! I’m sorry to hear you’re having trouble. As for pulling up, I’m afraid all I can think of is practice and trying to loosen your stitches – make sure to hold your yarn overs and loops all up hight while you’re making the stitch! When it’s time to pull through all the loops, try turning your hook so that the “hooky” part is pointing down, so it doesn’t catch any of the stitch loops. I hope that helps! Hello! The blanket is gorgeous! I am a little confused at the edging though. Row 73 went fine and I sc over that but then how do you sc the rest of the edging when it is not even? How do you cut the yarn you have been dragging and attach? Thank you! Would you know how many stitches in the chain i would work using the bernat blanket yarn to make a king size blanket? We had to evacuate from hurricane Florence and wanted to work on a project in the meantime and drive time to pass the time and stress. I just love the look and simplicity of this pattern! Hi Tamara! I am making a king size blanket for my daughter’s wedding gift. The pattern is lovely and I hope I can keep it going for the 216 rows needed to finish! I have a question regarding the yarn used. . . 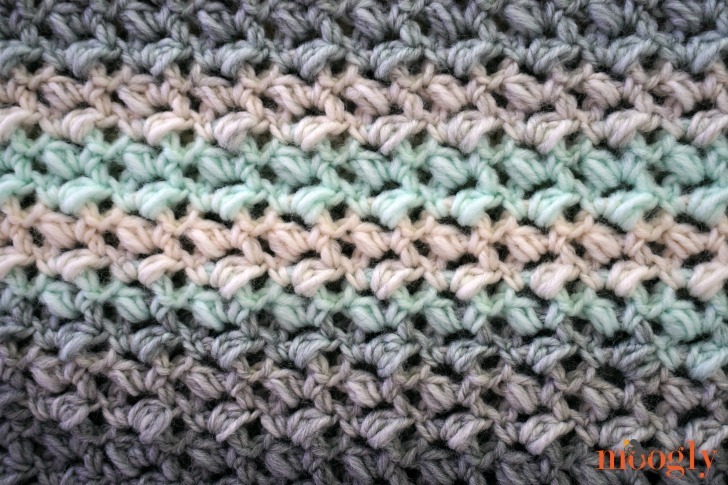 I have begun working with the Scarfie teal/cream and changed to mint/silver. Problem is that the mint yarn has lots of places where the yarn is like a thread and then gets very thick. After a couple of rows using the mint/silver, I had to tear it all out because it looked horrible! I certainly don’t want to spend all my time on this blanket and have it look like that. Is there another kind of yarn that I can use with the Scarfie in this pattern? Maybe a solid color yarn? ( I tried cutting out the thin places on the mint yarn, but there were so many places that I had knots all throughout the project. No problem with the teal/cream.). Thank you for this great pattern!